we work with PVC windows but we do not make them. We are specialist in fitting PVC windows. Optimised in its design to provide one of the strongest systems, allowing spans that are unbeatable. Thus saving aluminium cost and labour in installation. The system boasts from having standard, high insulated, timber aluminium, structurally glazed and unitized curtain walling within its suite. Click on our products below for more information. Unitized curtain wall system ALT EF65, utilising off-site unitised construction. This way of construction helps achieve a higher quality of quality as wll as quicker onsite installation. 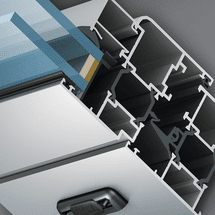 The main components of this system are frame profiles and transom bars which form units. 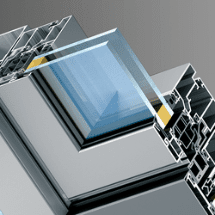 Infill units in such constructions are fixed with the help of glazing beads and wedge gaskets. ALT F50 is a curtain wall façade and roof system that offers unlimited creative freedom and allows maximum entrance of light into the building. The system offers different individual styles with various outside appearances. Any combination of vertical and inclined planes is possible together with the integration of different types of vents. The extensive range offers technical solutions for the different performance requirements of a façade such as fireproof, structural glazing and high insulating solutions. 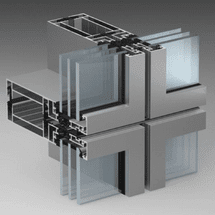 ALT W72, 62 & 50 is a range of window, door and framing systems used for commercial and residential buildings. All three window, door and framing systems offer standard open out, tilt turn, open in windows, doors are available as open in or out as single or double doors. 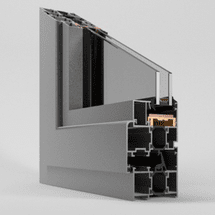 ALT W72 is one of the most thermally efficient 72mm window and door systems on the market. The thermally improved three-chamber system for windows and doors that boasts the optimum combination of safety and comfort. Fibreglass reinforced polyamide strips with ribs and/or hollow chambers guarantee high thermal insulation levels. 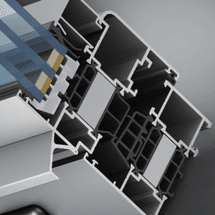 ALT W62 is a window and door system used for commercial and residential buildings, different types of frame constructions with tough requirements for the thermal and acoustical performance. This system offers fabricators the ability to make large windows and doors utilizing its sleek and slim design whilst being a cost effective solution over the W72 system from Al Windows.